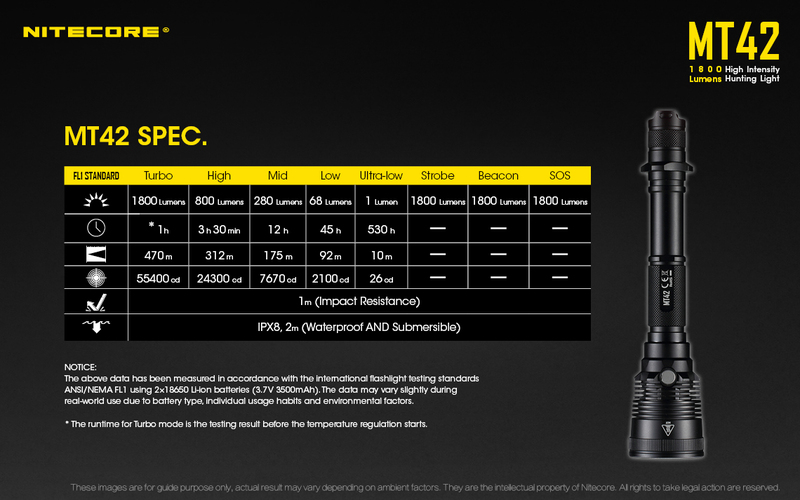 Nitecore MT42 is the newest generation of the MT40 line which features an upgraded 1,800 lumens with increased heat-sinking, a metal indicated side-switch, and a modified UI. If you are looking for a modern thrower with a traditional longer handle, then say hello to the MT42! Thanks to NitecoreStore.com for providing the sample! Overall, this is a much needed improvement to the previous MT40 such that there is no more body twist needed in the UI, which made mode memory challenging, and that the strobe is not in the normal selection cycle. One other nice thing is that the specs are pretty close to the previous MH41 but it’s $50 cheaper. There is only one option for the MT42. 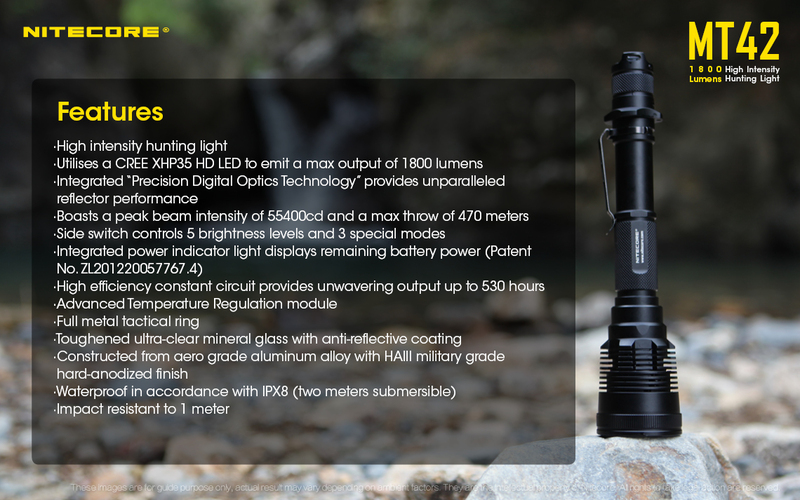 The light strongly resembles Nitecore’s MH41 with its large heat-sinks, but now it features the new illuminated metal side switch instead of the 2 plus/minus buttons. The switch is pretty but I’m a little mixed because it’s hard to find among the hills and valleys in the heat-sinks. The head is smaller than I expected but that’s probably because I have the MH40GT which has a bigger head. The finish on the light has an almost matte look which is really refined in my opinion. I also like that there is knurling on the tail cap which helps a lot when removing the batteries. The light is in three parts so be sure to tighten them all to use the light. While taking apart the light, the ninja star grip, near the tail, threw a surprise, it’s metal and has threads to keep it fixed! The head, as well as the tail have spring connections, which is need for for rugged uses like being gun-mounted. The light uses one CREE XHP35 HD. It seems a little strange that they would use a wide beam HD version, instead of the de-domed HI version in a throwy type light. 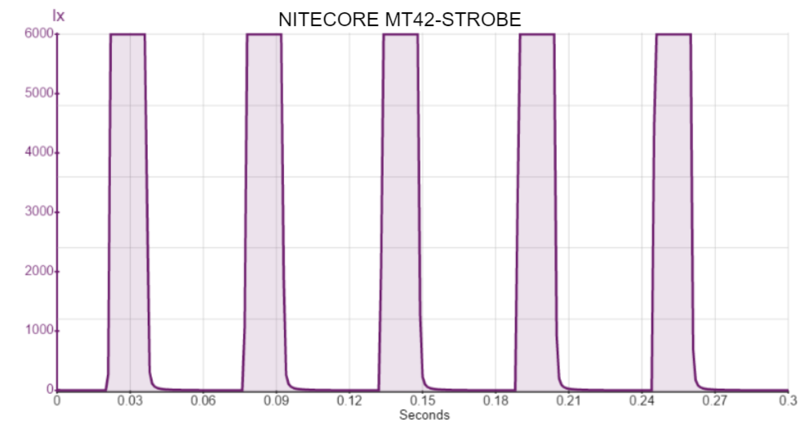 Nitecore does not advertise the angle of main LED but from what I’ve collected it seems to be a 60 total degrees of a very dim spill with a very strong 15 total degree spot. 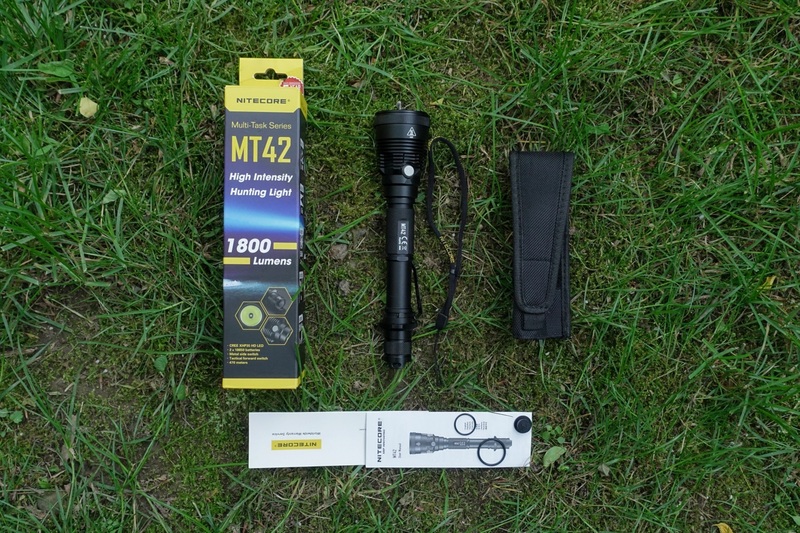 The MT42 is cooler and a little yellow in the center compared to the generally neutral Nichia 219B (in the Nitecore MT06MD penlight). I’m pretty easy to please on mode spacing but below is a beamshots video and stills that depict the different modes. Happy that there is a 1 lumen mode. 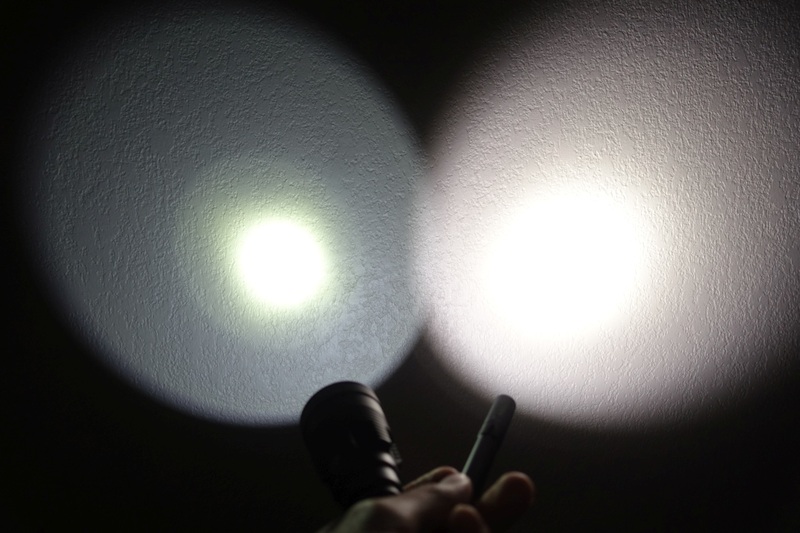 The light uses two 18650 batteries. The light CANNOT use primary or rechargeable CR123s and cannot use flatop cells. The battery level can be read by, starting in OFF, hold down the side switch, click on the tail switch, then let go of the side switch, then the indicator light will blink 3 times for more than 50% battery, 2 times for less than 50%, 1 time for under 10%. The indicator will also flash repeatedly, when on, when the battery is very low. I measured the light output in relative LUX and I have not spent time yet to calibrated for lumens. The charts I’ve provided, while are literally quantitative, I suggest using as a qualitative reference for how the output may behave over time; typically lights aren’t left on this long and the max output can be reset. 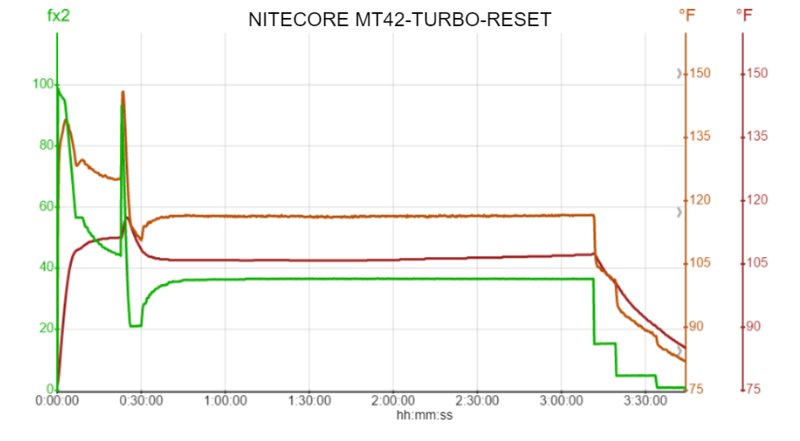 It’s worth to note that the runtime table provided by Nitecore states, “The runtime for turbo mode is the testing result before the temperature regulation starts.” so this isn’t physically reproducible in my tests. Temperature measurement was performed at room temperature with no fan cooling. The light runs on TURBO for about 3 min before gradually decreasing over the next 4 min. Soon after, I did a reset (turn off and on the light) and the light momentarily went back to full output but dropped sharply and slowly recovered. A max body temp of 116.0°F (red line) and out-the-front temp of 146.6°F (orange line) was recorded for TURBO. I’m a bit surprised how hot the out the front temperature got at first but this happened only briefly. The light does appear temperature regulated as it drops sharply after doing a turbo reset, then actually increases output once the temperature has cooled. Overall, the UI is an improvement but could use more shortcuts to ultra low and a latching turbo. 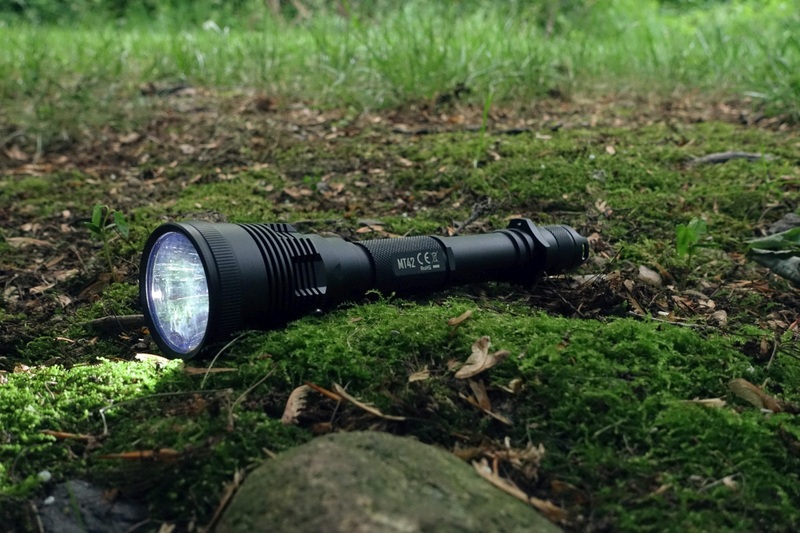 The light uses a 2-button interface, a mechanical clicky (forward tactical) switch in the tail (for turning on and off the light), and a single-stage electronic side switch (for changing modes). The UI does away with the typical MT UI which relies upon twisting the light. Also strobe is no longer in the primary rotation, thank you! Now there is a much better mode memory and a better shortcut for momentary TURBO. You can lockout the light but unscrewing the head or the tail cap at least a quarter turn. I also did notice that if you cycle through the modes too fast the strobe will pop-up a bit on you. The main comparison would be to Nitecore’s MH41 but I don’t own that one but they look almost identical. What I do have to compare to is the MH40GT which is a bit more of a thrower, so the head is bigger and the beam narrower (MH40GT happens to be on the right in every picture below). Ninja star, for tactical grip, is actually metal and has threads for affixing it to the light.